This book gives every student the necessary tools to write with clarity and confidence. For students in the middle grades and above, Writing With Skill provides essential training in organization, composition structure, and research methods. ~ One- and two-level outlining. I am trying to look at a sample of the student text but it seems that the link might be broken as I am redirected to the exact same page just in another tab, with no preview. I would like to see a sample in order to make a decision between buying a hard copy or pdf. Does the child need to write in the student book or could they simply use it as a ‘textbook’? Taryn: Sorry about that broken link! Please use this one: http://downloads.peacehillpress.com/pdfs/samples/wws/WWSstudent-sample.pdf. When you click on it, the PDF will start downloading to your computer. No, the student would not write in the book for this program…there is a lot of writing, and it will need to be done on their own paper or on a computer. I am trying to look at a sample of WWS1 student workbook, but the link appears to be broken…Thanks! I wanted to check out the samples, but when I clicked on the link nothing happened. I was able to view the samples for Writing with Ease, so I don’t think it’s a browser or OS issue. Our apologies! Please click this link, and a PDF sample will download to your computer. I have heard that there is a “faster pace schedule” available for older kids that are starting with WWS Level 1. (I have an 11th grader and I am hoping to get through it a little faster than one year. ) Is this true? If so, where can I find this link/ schedule? If I buy the PDF, how many pages is it? Amy: the PDF of the Level 1 Student Workbook is 568 pages. For the Writing With Skill program, we highly recommend that all students do the entire program in order without skipping (Level 1, Level 2, Level 3). This particular program builds on itself, and so it is most beneficial when done from start to finish. Students generally begin this program in grade 5, 6, or 7, but it is rigorous enough to be used with 9th or 10th graders as well. 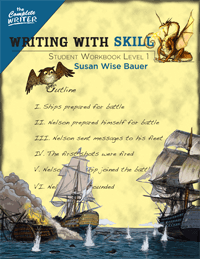 I have systematically worked through Writing With Ease, Levels 1-4. Next year I’ll have a 5th grader. Is this Writing With Skill, Level 1 the next step? Are these meant for 5th-8th graders? Thanks! If I am getting the student book in PDF form for my children, how many licenses do I get? Do I need a book for each child? Could I use this in a homeschool co-op setting with a handful of students? Angelique, you may make as many copies as you need for your own family. For a co-op, you could either purchase a student book for each child, or you could contact us about getting a reprinting license (100 dollars per book per year per class). Email [email protected] or call 1.877.322.3445 to purchase one. With the Writing with Skill and Writing with Ease books – will the student need to have a separate reading comprehension workbook? Or is that covered in the writing books? Reading comprehension is covered in the writing books. Learning how to understand what a student is reading is a big part of the curriculum.